Cefaly works with an electrode applied on the forehead. Electrodes are designed to be used between 15 and 30 times. Very important: the skin has to be cleansed thoroughly and degreased with soap and water before the electrode is applied. After use, the electrode has to be put back on its transparent plastic support sheet and then stowed in its bag to prevent from becoming dehydrated. Now available in Australia, Cefaly is a drug-free method for treating migraine pain and preventing migraine headaches from ever occurring. Cefaly treats migraine pain with neurostimulation – a stimulus that limits pain signals from the nerve centre by working on the trigeminal nerve where migraine headaches start. The patented Cefaly treatment changes the trigger threshold of migraine headaches. As the pain threshold becomes harder to reach, migraine headaches are less frequent, less painful, and simply disappear. Cefaly offers patients suffering from migraine pain and headaches an efficient electrotherapeutical treatment delivered via an extremely comfortable, ergonomic and simple-to-use medical device. Cefaly Headband for drug-free migraine relief. Not only is Cefaly a drug-free method for treating pain, this migraine treatment can also prevent headaches from ever coming on. Cefaly Headband treats migraine pain with neuro-stimulation. Headache relief starts at the nerve centre, working on the trigeminal nerve where migraines start. This patented treatment offers real relief of migraines with an efficient nerve stimulation approach. This is your migraine relief technology in a comfortable, ergonomic and simple-to-use medical device. 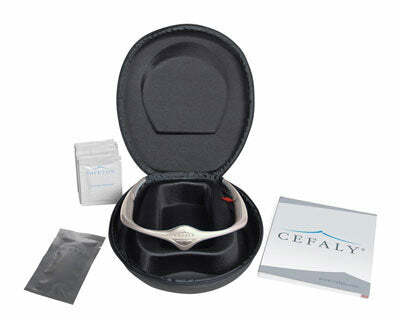 Cefaly Headband is a patented system and bears the CE medical mark. It has been designed and developed in accordance with the strictest quality standards, complying with directive 93/42/EEC pertaining to medical devices and with all associated international IEC standards.